The Call-Em-All and Erecruit integration allows you to use your Call-Em-All account and have our system automatically log and make notes in your Erecruit account for you. This way, you are not manually having to make notes on who you contact, what you said to them, when this happened, and the like. *Note: If someone on your team has entered this information before, Call-Em-All has this stored and can provide it to you. Contact us at info@call-em-all.com for this. 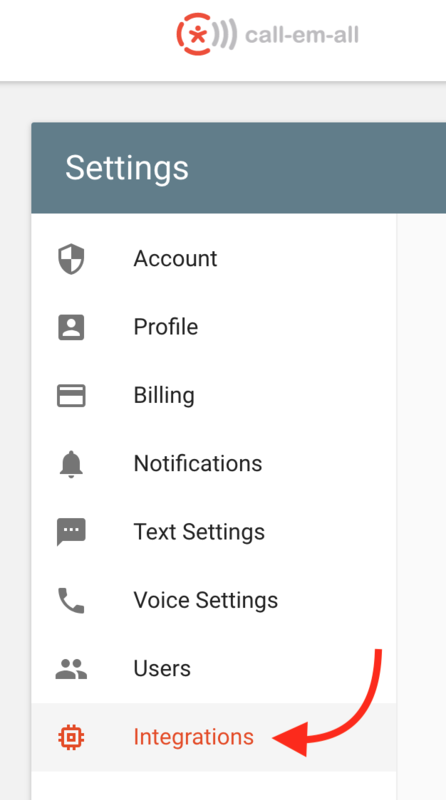 Once that's done, log into your Call-Em-All account and click on Settings. Next, navigate to Integrations on the left panel. 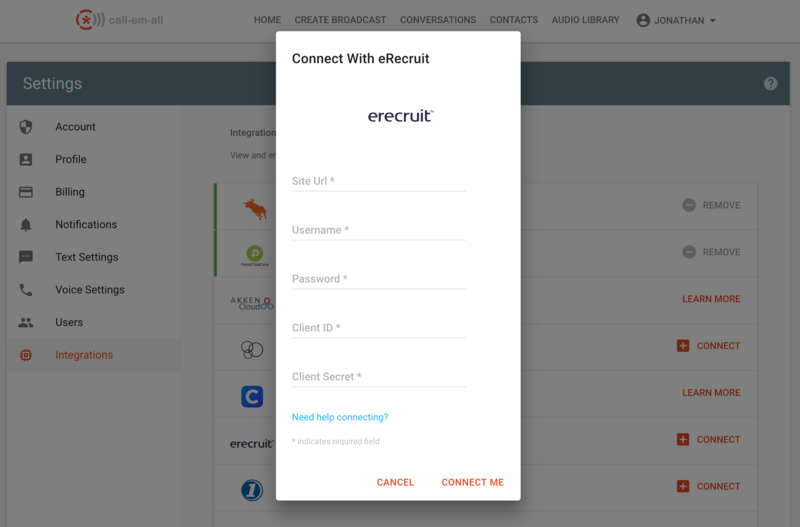 Last, find Erecruit and click Connect. From there, please enter the information you obtained at the beginning of this support article. After you do that, you'll be all ready to go! You can view the results to your Call-Em-All voice broadcasts, text broadcasts, and text conversations in the Erecruit candidate or contact profile. Simply go to the Notes section of the candidate/contact. We list your activity there in chronological order for your review. By default, Call-Em-All can write notes in Erecruit at about 10 per minute. Meaning if you're sending a lot of text and voice messages, this might take a while. To increase the speed, please send in a support ticket requesting that your Client Settings be changed to <RestApiSettings PerSecond="1000" PerMinute="10000" PerHour="100000" PerDay="1000000">. This ticket is required by the client per SOC compliance, hence why Call-Em-All nor Erecruit can make this change for you.